You can’t start at the mouth of the Boyne River and swim upstream to some of the tallest hills in Michigan’s Lower Peninsula without running into some obstacles. In fact, there are three impoundments frustrating the river that is Lake Charlevoix’s second largest tributary, two of which are formed by dams. However, these three impoundments, and a handful of faulty road/stream crossings, have not managed to exhaust the river; the Boyne River maintains stellar water quality, strong ecological diversity, and some of the best fishing and canoeing you can find in Northern Michigan. The first impoundment, the Boyne City Mill Pond, is located within the City limits and not too far from the river’s mouth. This impoundment isn’t the product of any dam, but does have similar effects on the river, because the pond collects sediments and raises the temperature of the water downstream. Called Little Lake in the 1901 Plat Book, the pond has been heavily used by various industries in Boyne City. The second impoundment you would reach is the 80 acre reservoir behind the Boyne USA Power Plant Dam. The dam and power plant were built in the early 1900s to provide electricity, and the reservoir is now completely surrounded by private property. Because the dam prevents anadromous fish from swimming upstream, it has divided the river into two distinct fisheries: steelhead and salmon are caught downstream of the dam, while upstream of the dam is an excellent brook and brown trout fishery with some sections designated as Blue Ribbon Trout Stream by the Michigan Department of Natural Resources. 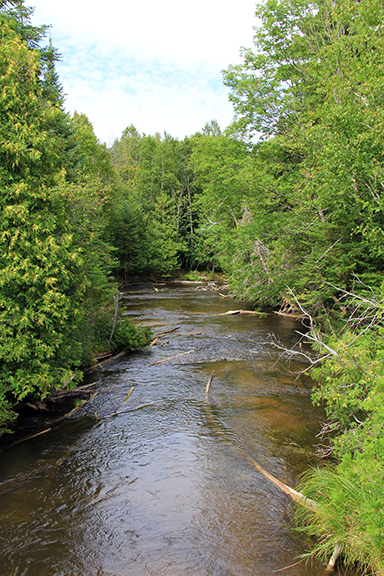 There are two branches of the Boyne River that split above the Boyne USA Power Plant Dam: the North Branch, with headwaters in eastern Charlevoix County, and the South Branch, with headwaters in Otsego and Antrim Counties. The North Branch has no dams or impoundments along its length, but the South Branch does have one. This is the reservoir created behind the M-75 dam at Boyne Falls. This dam was built in the 1800s and powered both a saw mill and a grist mill, which ground grain into flour. The reservoir used to be deep enough to sustain a great brown trout fishery, but has filled in with sediment and is now shallow. Meet our dedicated Boyne River Volunteer Stream Monitors. Thanks Team! The Boyne River is monitored every three years through the Watershed Council’s Comprehensive Water Quality Monitoring (CWQM) Program for dissolved oxygen, specific conductivity, pH, nitrate-nitrogen, total nitrogen, total phosphorus, chloride levels, and total suspended solids. Biological monitoring is also performed by volunteers in the Boyne River each spring and fall as part of the Watershed Council’s Volunteer Stream Monitoring (VSM) Program. This stream is monitored through the Little Traverse Bay Bands of Odawa Indians Surface Water Quality Protection Program (SWQPP). The Lake Charlevoix Watershed Management Plan and its Advisory Committee are working to protect the River, as it directly influences the water quality of the Lake. The purpose of the Friends of the Boyne River is to improve and conserve the environmental health and recreational quality of the Boyne River and its watershed.